Local press article and interview with Jennifer Cooper on the history and living culture of Crossbones Graveyard. The journalist, Frederica Miller, gets a few details wrong – the Museum of London estimated there are 15,000 burials at Crossbones – but she tells the story in a way that will hopefully make it more accessible to all. The 175th Vigil, held on the 23rd of every single month since 23rd June 2004 – to remember the outcast, dead and alive, to renew the shrine at the gates and to reclaim the secret history of Crossbones as revealed by The Goose to John Crow on 23rd November 1996. We each bring our own piece of the puzzle, and together we perform acts of remembrance and imagination, secular Human Rites, open to ‘all faiths and none’. 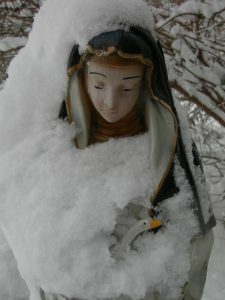 Specific vigils are aligned with seasonal festivals – e.g. January 23rd is Imbolc, April 23rd is St George, June 23rd is St John’s Eve / midsummer, October 23rd is Halloween Portal, November 23rd is ‘Goose Night’. At the 23rd December Vigil we mark the winter solstice and the coming of the light, Yule – and Christmas, with lusty singing of traditional carols and sharing of tasty treats. Come prepared to join in with such classics as ‘Deck The Halls’, ‘I Saw Three Ships’, ‘The Twelve Days of Christmas’ and ‘We Wish You A Happy Christmas’. Yuletide and other seasonal songs are also welcome, especially if they’re easy for everyone to join in. Please bring your own mementos or ribbons with the names of your lost loved ones to tie to the gates. 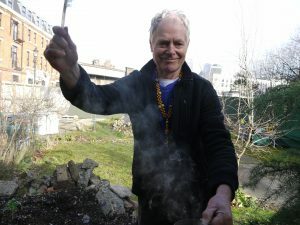 You might also like to offer a short poem, song or personal testimony to the spirits of Crossbones Graveyard. Or be a ‘Goose Rhapsode’, learning part of ‘The Book of the Goose’ or another short poem from The Southwark Mysteries to recite on the night. 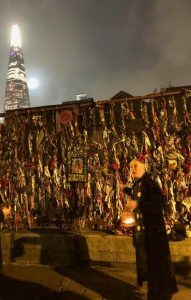 23rd November 2018 marked the 22nd anniversary of the night The Goose walked John Crow about The Liberty of The Clink, to reveal her Secret History at Crossbones Graveyard. It was also the 174th Vigil for the Outcast – so, once again, I came to remember, to renew and to offer my gratitude for these works that changed my life, as I enter the 23rd year of service to The Goose and The Crow. Conducting the Vigil, I was a bit scatty, drifting off a couple of times – and Priestess Jacqui had to step in at the end to remind me to complete the ‘Goose may your Spirit fly free!’ blessing amid much hilarity! As ever on Goose Night, John Crow performed The Book of The Goose – with Jennifer Cooper stepping up to deliver ‘By The Grace of Our Lady Mary Overie’, thereby showing the way for all who’d like to become a Goose Rhapsode, learning some verses of The Southwark Mysteries and so enabling Her spirit songs to be sung long after this John is done and dusted. Jacqueline Durban delivered a fierce moving poem on Remembrance, Drew Galdron sang his song of ‘The Coldest Kiss’, Nicholas Greaves gave powerful testimony from the Trans community, remembering those whose lives were cut short because of the way they were pushed to the edge, the outsiders of the outsiders. Maximum respect to our Goose Samurai crew, master and mistressfully co-ordinated by Jules and Jenn, and as ever to Katy Kaos for her many workings behind the scenes. 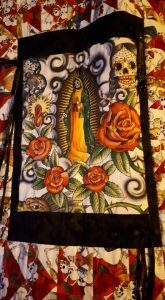 In the photo you can see Jenn’s magnificent Santa Muerte hanging over Crow’s right shoulder. (Offscreen, Our Lady of Crossbones watches his left.) All this, and much more, with seven candles for Red Cross Mary and the full moon rising over Crossbones as we entered the portal. Advance booking recquired. John Constable’s 2017 Urban Magic workshop was fully booked in advance, leaving many disappointed. Book now to be sure of your place. To remember the outcast, dead and alive, to renew the shrine at the gates and to reclaim this magical place as sacred ground. 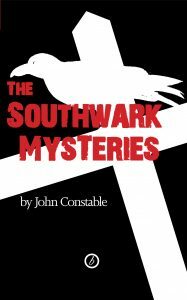 This month’s Vigil marks the 22nd anniversary of ‘Goose Night’ (23rd November 1996) when The Goose spirit revealed the secret history of Crossbones to John Crow, inspiring The Southwark Mysteries and the works at Crossbones Graveyard. 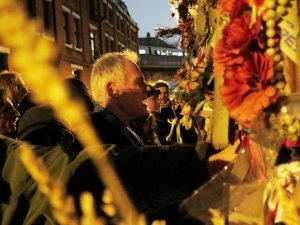 Please bring your own mementos or ribbons with the names of your lost loved ones to tie to the gates, and perhaps a poem, song or short personal testimony to offer to the spirits of Crossbones Graveyard. In 2010 we completed the magical cycle of 13 annual performances of The Halloween of Crossbones, which began in 1998. We revived it in 2015, when we danced with the dead with Wolfshead & Vixen GOTH MORRIS, and again in 2016, when Jacqueline led a silent communion with the spirits. We’d only do it again in the most exceptional circumstances. 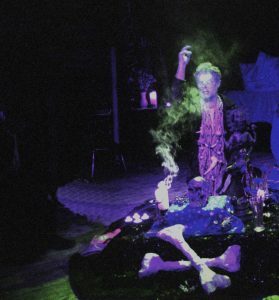 We now perform our rites for the outcast dead at the Crossbones Vigil / Halloween Portal every 23rd October. For friends who miss our samhain shamanigans, here’s Andrew Logan’s exquisite film of The Halloween of Crossbones IX (2006) back in the wild days when we could still party in the ‘Drome’ caverns under London Bridge. The film ends with John Crow’s prophesy that we’ve come “… to create the garden that will one day flower here, despite the attempt of developers to turn it into three office blocks.” Back then it was simply a vision and a call to arms. Nine years later, the Crossbones Garden of Remembrance opened to the public. 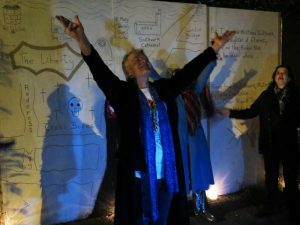 Thanks to everyone who helped make it happen, to Jennifer who publicly envisioned the garden at a Vigil, and especially to the cast and crew of The Halloween of Crossbones – Michelle Watson, Niall McDevitt, Jahnet Rani Ji and Ground Control aka Katy Kaos. Poems from The Southwark Mysteries by John Constable. Recorded music by Mark Ominous. Produced by Martin Scooby. Merry Samhain and a Happy New Year! Thanks to our long-standing Friends of Crossbones and the many new supporters who gathered last night at Crossbones Gates for our Vigil for the Outcast / Halloween Portal. 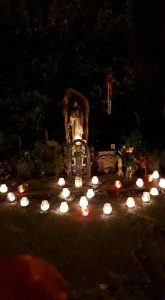 The 23rd October Vigil is also our Halloween Portal – when we gather under the banner of Santa Muerte to perform the rituals originally conducted during our magical cycle of 13 Halloweens, including the Reading of the Names of the Dead – those buried at Crossbones and our own lost loved ones. This ceremony was followed with songs, poems and meditations by John Crow, Michelle Watson, Tommy Calderbank, Jacqueline Durban, Mervyn Syna, Mark Juhan, Jerry and Jules. Big up Jennifer Cooper for her brilliant rendition of ‘Twilight of the Trade Marks’, showing the way for future participants in the Vigil to learn and perform one of the poems from ‘The Southwark Mysteries’ to incorporate the Goose and Crow spirits. Thanks for the powerful presence of Andy, Susanna, Maggie, Lana, Joanna, Jonathan, Elizabeth, Emma, Aileen and some bloods so new I don’t yet know their names. Sorry if I’ve missed someone. By the end, there were roughly 70 of us there and, as so often, I was a bit overwhelmed. All this, with The Shard and a full moon rising over the Crossbones Gates as we faced the burial ground to deliver our unconditional blessing.